Keltner Channels from Chester Keltner in How to Make Money in Commodities (1960) trails stops from a moving average instead of from Closing Price. Exit your long position (sell) when price crosses below the Volatility Stop. Exit your short position (buy) when price crosses above the Volatility Stop. 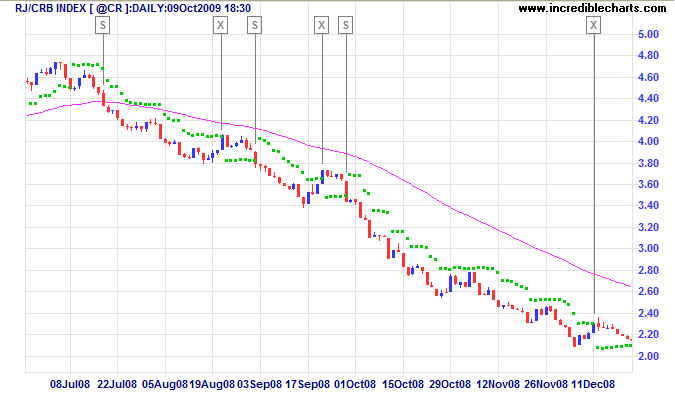 The RJ CRB Commodities Index late 2008 down-trend is displayed with Volatility Stop (3 x 21-day ATR) and 63-day exponential moving average used as a trend filter. No long trades are entered while price is below the 63-day exponential moving average, nor short trades while above. Welles Wilder used 7-day Average True Range and a multiple of 3. We have set the default, however, to a smoother 21-day Average True Range but retain the multiple of 3. Welles Wilder's system uses Closing Price and incorporates a stop-and-reverse feature (as with his Parabolic SAR). Set SIC equal to the latest Close, reverse the trend and continue. SAR assumes that the trend has changed every time that your stop is hit. Most traders will find that there stops are regularly hit without the trend changing — price merely retraces through your stops and then resumes the up-trend, leaving you lagging behind. Average True Range Trailing Stops addresses the first weakness, Chandelier exits caters for the second, while Average True Range Bands addresses both.